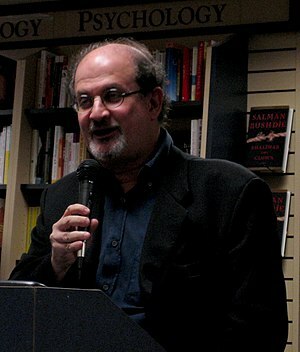 Salman Rushdie was born today in Bombay, India in 1947. He is 65 years old. Rushdie is a novelist who combines magical realism with historical fiction in his works. He is probably best known for The Satanic Verses , a novel for which he was ‘sentenced to death’ by Ayatollah Komeini. 1 He spent most of the following decade underground to avoid the fatwa. His Midnight’s Children won the Booker Prize in 1981. Other works include Shame, The Jaguar Smile, The Moor’s Last Sigh, The Ground Beneath Her Feet, Luka and the Fire of Life and The Enchantress of Florence. He was appointed Commandeur dan Ordre des Arts et des Lettres in 1999 and dubbed a Knight Bachelor by Queen Elizabeth II in 2008. In this country he was elected to the Academy of Arts and Letters as a Foreign Honorary Member the same year. This entry was posted on Tuesday, June 19th, 2012 at 1:17 pm	and tagged with Salman Rushdie and posted in Thought of the Day, Today's Birthday, Writing. You can follow any responses to this entry through the RSS 2.0 feed.